It’s January and yes, we’ve got gray skies, rain pouring, and wind blowing outside. We’ve gotta say…it’s pretty dreary out there this time of year. But just because the outside isn’t a paradise of blue skies and sun, doesn’t mean you can’t bring a little bit of paradise inside. To do this, we’re envisioning sitting in front of a blazing fireplace and sipping an ice cold, fresh mango smoothie. We have an awesome selection of Tommy Atkins mangos right now that are just perfect for a little bit of sweet, yummy flavor. So go ahead, put on a warm sweater or fuzzy slipper socks, curl up in front of the fireplace, and start sipping this tangy, tasty, tropical smoothie. Directions: Blend the banana with the juice until banana is well mixed. 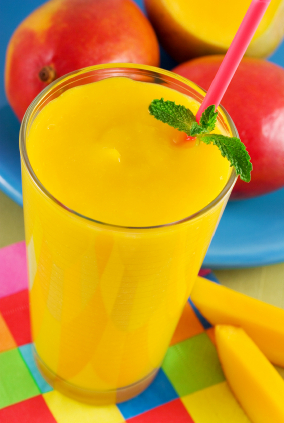 Next, add the ice cubes with the mangos and pineapples and blend for 1 minute on high, or until ice is slushy.